Hanoi (VNA) – Vietnam welcomes and creates all possible favourable conditions for investors across the world, including Macquarie Capital of Australia, to invest in Vietnam and cooperate with Vietnamese partners in developing infrastructure, and clean and renewable energy, said Deputy Prime Minister Trinh Dinh Dung. Deputy PM Dung made the affirmation at a reception for President and General Director of Macquarie Capital John Walker in Hanoi on March 25, during which he praised the Australian firm for its methodical market research and assessment, laying the foundation for developing investment projects in renewable energy in Vietnam. He highlighted the fruitful development of the Vietnam-Australia strategic partnership, saying that the bilateral trade and investment ties have recently flourished. According to the Vietnamese leader, two-way trade between Vietnam and Australia hit over 7.7 billion USD in 2018, growing by 19.3 percent. Australia currently has 425 investment projects worth 1.84 billion USD in Vietnam, ranking 19th amongst the country’s foreign investors. Meanwhile, Vietnam has 47 projects valued at about 256 million USD in Australia. Australia is one of the largest non-refundable ODA providers for Vietnam, reaching 92.7 million AUD (over 65.7 million USD) per year. Deputy PM Dung underlined the great potential for the two sides to boost trade and investment cooperation, adding that Macquarie – one of the leading investors in Australia and the world – wanting to develop large-scale investment projects in Vietnam will create great attraction and motivation for businesses of both sides. 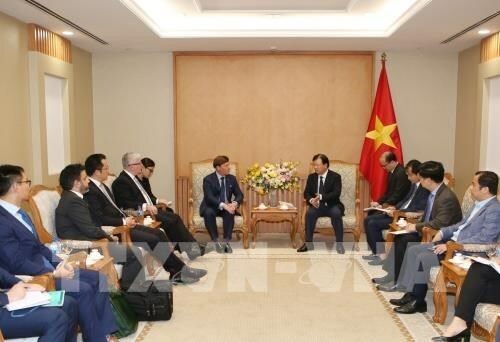 He suggested that the Australian company work closely with relevant ministries and localities to promptly decide on specific projects in the form of direct investment or joint ventures, and coordinate with Vietnamese partners to implement them. For his part, Walker asserted his firm’s wish to invest in Vietnam, especially in clean and renewable energy, adding that Macquarie will consider investing in infrastructure development projects in the future. With Vietnam’s transparent investment environment, Macquarie will be sure to operate effectively in the country, thus attracting more and more big Australian investors to the Southeast Asian nation, he said. Macquarie Capital is the subsidiary of the Macquarie Group, which focuses on two major areas of investment and infrastructure management. It is in charge of investment, with experience and resources to invest in infrastructure, energy, and renewable energy sectors.